"Build it and they will come." Never a truer word spoken when it comes to the people who make the reams of vampire merchandise available to purchase. Apparently they operate under the philosophy that slapping a pair of fangs on something or using vaguely goth-esque packaging will, as the Brits say, have the punters lining up. In principle I'm not opposed to fun merchandise (hell, I'd kill for a Wolfram & Hart t-shirt or a neon Fangtasia sign) but these ice cube trays leave me cold (har har). First of all, how many of these things are you going to need to make enough drinks for you and your vamp-loving friends (one tray makes two sets of fangs)? Secondly, the result is not 'cool ice fangs' so much as Dracula's dentures in a glass of cleaning solution. Meh. But hey, if you're into them, that's all that really matters. 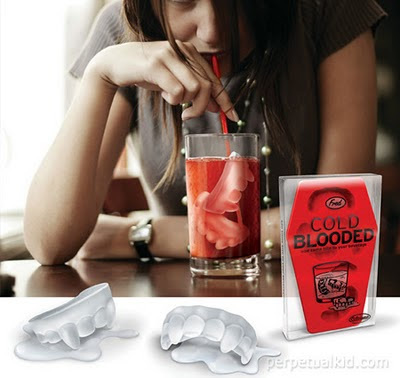 Cold Blooded Vampire Ice Cube Tray, $US7.99. Available here.